Christ Church, Southwark, is a church of the Anglican denomination situated on the west side of Blackfriars Road, London. At the time of the foundation there was no bridge at Blackfriars and so no major road connecting the area to the south or to the City. The parish of Christ Church, Surrey was created by Act in 1682 in the manor of Paris Garden as a result of the gift under the direction of the executors of John Marshall, a member of a Southwark family of “whitebakers”. This was previously part of the St Saviour’s parish. His will, of 1627, provided from 1637 and directed that a new church should be built and a Rector be appointed and paid for in that Manor, the most easterly part of St Saviour's parish. He died in 1631. The church was built in 1671. This charity still provides for these purposes. The John Marshall Trustees are independent of the parochial charities and the wealth they have accumulated for its objects are distributed over most of the counties of Kent, Surrey (including those parts now in Greater London) and Lincolnshire. The beneficiaries are Rectors of parishes of the Church of England. The first charge on the charity is the maintenance of Christchurch which they have completely rebuilt in 1738. The first had been built on marshy ground, and by the 1720s was in a poor condition and collapsed. By an Act of Parliament dated 1738, the trustees were empowered to demolish the church and rebuild it in an improved enclosure. By 1741 the new Christ Church had been completed in Italian Romanesque style with a clocktower rising in three stages from the ground, surmounted by an octagonal lantern and cupola. 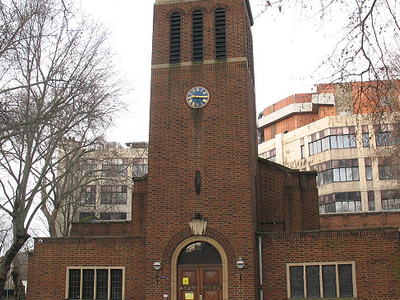 The current church was built in 1958, following total destruction of the previous building in 1941, during the London Blitz. Here's the our members favorite photos of "Churches near London Borough of Southwark". Upload your photo of Christ Church!